Alison enabled the purchase of the yarn (even spotted me the cash to buy it!) from fellow Knitsmith Reese. It sat in my stash for a bit while I was waiting for inspiration when one day it hit me: I needed knee socks. Red ones. With cables. The cable up the back of the leg was based on a cable I found in the Stitch Bible. I sort of made up the calf shaping as I went. 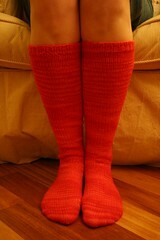 I loved these socks as soon as they were done. The yarn was so soft that even I, the Great Allergic One, could stand to wear it next to my skin for brief periods of time. These pictures don't really do the colors justice, either -- a bright, clear red with a petal pink. They were perfect for commuting on public transportation on a cold winter's day -- I would wear them on my way to work to keep my legs warm, and take them off when I got to the office. I'm sad to report that these socks were recently lost in a felting incident. I'd happily make myself another pair, but both Reese's blog and Etsy store have been dormant for some time, so I think the chances of getting any more yarn like it is pretty slim. A moment of silence, please, for the Kneesocks.